← Bailout Blues + Red Ink = Spending Revolution Needed. The rumors are true. There’s a detailed Oregon Coast website at OregonCoastTravel.net, which is the official website of the Oregon Coast Mile by Mile guide that showcases the entire Oregon Coast from California to Washington. 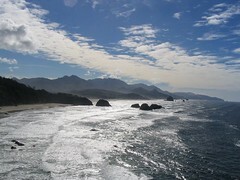 Highway 101 is the spectacular 363 mile National Scenic Byway and the only road along Oregon’s Coast. Oregon Coast Travel has a feature where you can see the mileage for every point of interest along the entire Coast highway which is how the Oregon Coast Mile by Mile printed guide is designed. You can also search the coast by city from Brookings to Astoria, including small cities as well as the tourism “hot spots” of Bandon, Lincoln City, Newport, Gold Beach, Canon Beach, and more. This entry was posted in oregon, oregon coast, tourism, travel and tagged astoria, brookings, lincoln city, newport, oregon coast, oregon travel. Bookmark the permalink. Once things settle down I think we will plan a major trip out that way next summer Joe. I really think taking a road trip around Oregon would be amazing. That’s a good plan Glenn! We can even try to round up some of the folks you know from the discussions here and eat out over at Galice or maybe even raft the river, which is always a lot of fun. Which month is best from May through August? Early September, after the kids go back to school. Oregon summers start July 1st and last well into September; June is an unreliable month weather-wise, though you get some incredible days sprinkled in during Spring. Before I had kids that precluded Sept. vacationing, we always did our Northwest vacationing in Sept. Realize that doesn’t fit your timeline quite, but the hordes of humanity that descend on the Oregon coast in July/August are overwhelming. While I love our coast, it has definitely been “discovered”. Now the Southern Oregon coast can be ok in June, weather a bit more reliable to the South, and the scenery from Coos Bay South to Brooking is nothing short of spectacular…and because you get far away from PDX, the hordes aren’t so bad either. Our kids are out of school in May and they go back in the beginning of August. We will have to figure out how to balance this. This year we kept the kids out of school an extra week at the beginning so we could extend our summer vacation but I try not to do that. I am excited to see Oregon first hand. Paul good advices there, but I’m not sure “hordes” has the same meaning in Florida as here in Oregon where it’s pretty easy to find … a quantum of solace…. Joe…good point. We have year round residents of about 50k in these parts but soon the snowbirds descend and we swell to almost 200k. Interesting infrastructure issue to dell with such a population swing for 6 months of the year. Love it here on the OR coast. Last night was amazing…on the 102-year anniversary of the wreck of the Peter Iredale, the winds were calm, the temp was about 60 and the razor clamming was fair.